Get an early look at the incredible new TAG TEAM Pokémon-GX coming soon to the Pokémon Trading Card Game. Pokémon pair up for unprecedented power in new TAG TEAM cards coming to the Pokémon TCG! With enormous HP and huge attacks, these Pokémon duos are ready to go the distance in any big battle. Plus, every TAG TEAM is a Pokémon-GX, so they all have an awesome GX attack. Protect them at all costs, because when your TAG TEAM is Knocked Out, your opponent takes three Prize cards! Check out the first six TAG TEAM Pokémon-GX that you'll soon be able to battle with in the Pokémon TCG! Plus, hear from members of the Pokémon TCG creative team on the making of these powerful new cards! These TAG TEAM Pokémon-GX are part of the Pokémon TCG: Sun & Moon—Team Up expansion, which will be available February 1, 2019, in the Pokémon Center and where Pokémon TCG products are sold. One Pokémon is nearly seven feet tall and weighs more than half a ton. The other is a wee thing, barely a foot tall and just over 14 pounds. Yes, Snorlax and Eevee may be on opposite ends of the size scale, but these two clearly know how to work together as a TAG TEAM: Eevee & Snorlax-GX can do some serious damage! To begin with, their Cheer Up attack, which lets you attach an Energy card from your hand to 1 of your Pokémon, helps to quickly get a lot of Energy in play. You'll want that Energy for the duo's Dump Truck Press attack, which does a considerable 120 damage—plus another 120 damage if your opponent's Active Pokémon is an Evolution Pokémon. If that wasn't enough, the pair's Megaton Friends-GX attack hits for 210 damage, and with at least one extra Energy attached, you get to draw cards until you have 10 in your hand. Land a potentially devastating hit on your opponent and load up on cards for your next turn? Not a bad deal! Let's see what the game designers at Pokémon TCG developer Creatures Inc. can tell us about this cuddly couple! Why did you choose to match up these two Pokémon as TAG TEAM partners? 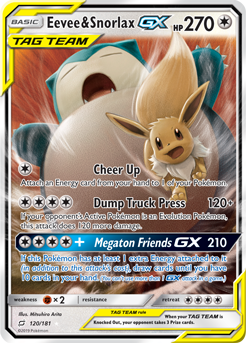 Atsushi Nagashima, game director, Pokémon Trading Card Game: The idea of mismatched partners is a rather common one, but we wanted to express it with this card that features the big and laid-back Snorlax paired with the fast-moving, energetic, and cute Eevee. The more different the Pokémon are from each other, the easier it becomes to imagine what kind of relationship they might have. How did you combine the distinct traits of these two Pokémon onto a single card? Mitsuhiro Arita, illustrator, Pokémon Trading Card Game: I wanted to capture the leisurely feeling that Snorlax gives off as well as the cuteness of Eevee. I tried to express the heaviness of Snorlax's body, cutting through the air as it tries to collapse on its opponent, to convey a feeling of these two Pokémon fighting together. On their own, Legendary Pokémon are incredibly powerful. But when Pokémon like Latias and Latios join forces, they can be unstoppable! Now the combined strength of the Eon Pokémon comes to the Pokémon TCG. The TAG TEAM Latias & Latios-GX zooms into battle at full speed with the huge Buster Purge attack, delivering enough damage to Knock Out most of the Pokémon this duo could face in a single blast. 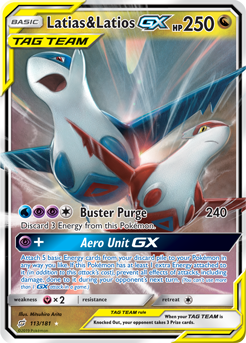 You'll have to discard Energy, but the TAG TEAM's Aero Unit-GX attack makes it easy to replenish and attack again. You can even get a team bonus to protect this TAG TEAM for a turn if you have an extra Energy attached when you use this incredible GX attack. Draw from the might of two Legendary Pokémon with the TAG TEAM Latias & Latios-GX! 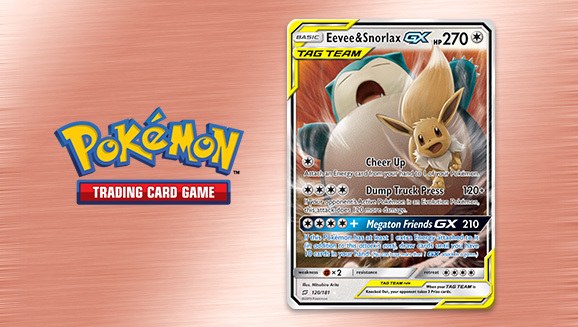 Hear from the game designers at Pokémon TCG developer Creatures Inc. about the Eon Pokémon's TAG TEAM appearance! Atsushi Nagashima, game director, Pokémon Trading Card Game: When thinking of pairs for TAG TEAM Pokémon-GX, we wanted them to be intuitively exciting to players, but we also wanted to think of what kind of story might have led the two Pokémon to join forces. We explored ideas for different relationships they might have from a variety of perspectives, such as their synergy, whether or not they are buddies or rivals to each other, how well they could synchronize with each other, how their combined power could be multiplied rather than just added, or what kind of combined attack they might be able to use. We came up with a lot of pairs in which the two Pokémon do not resemble each other, so with this TAG TEAM Pokémon-GX card, we decided we wanted to pair two Pokémon that are very similar, which is why we chose Latias and Latios. Mitsuhiro Arita, illustrator, Pokémon Trading Card Game: These two Pokémon naturally pair with each other, and it makes sense for them to team up. To make the TAG TEAM feeling even stronger, I had them both fly at an extremely high speed, causing a powerful shock wave to occur. Halloween may have come and gone, but that's not stopping Gengar and Mimikyu from continuing to get their creep on. 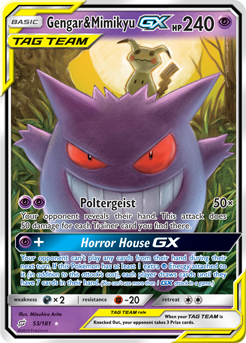 This terrifying team comes together in a Gengar & Mimikyu-GX TAG TEAM that will send a shiver up anyone's spine when it shows up for battle. Your opponent should be especially afraid if they're holding onto a bunch of Trainer cards. This Pokémon's Poltergeist attack forces them to reveal their hand, and then does 50 damage for each Trainer card that's uncovered. The Horror House-GX attack doesn't cause any damage, but it will certainly disrupt your opponent's strategy by preventing them from playing any cards from their hand during their next turn. And for just one extra Psychic Energy, each player must draw cards until they have a hand of 7 (which could mean your opponent is holding more Trainer cards—perfect for a follow-up Poltergeist attack). Check out what the game designers at Pokémon TCG developer Creatures Inc. have to say about this portentous pair! Atsushi Nagashima, game director, Pokémon Trading Card Game: We put a lot of thought into each pairing of Pokémon for the TAG TEAM Pokémon-GX cards. With this card, we didn't want to just make it a powerful card, but we also wanted to deliver new gameplay to players. Gengar & Mimikyu were paired more to match that new gameplay concept than anything else. Mitsuhiro Arita, illustrator, Pokémon Trading Card Game: The difference in size between these two Pokémon is actually much larger than I think most people would guess. Both of them share the characteristic of their ears or horns standing out, and both give off a bit of a spooky impression, so I felt it would be a good idea to place them in front of a moonlit night sky. Have you ever seen a pair of Pokémon that look as confident as Celebi and Venusaur here? When the two join forces for this Celebi & Venusaur-GX TAG TEAM card, your opponents will understand why they're so sure of themselves. The team's Pollen Hazard attack doesn't cause a ton of damage on its own, but leaving your opponent's Active Pokémon Burned, Confused, and Poisoned can lead to some serious ongoing damage. 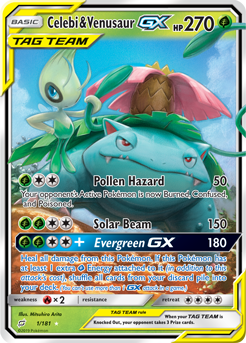 But it's the Evergreen-GX attack that has the potential to be a real game changer—it hits for a considerable 180 damage, and it has the added benefit of fully healing Celebi & Venusaur-GX. Then, if the TAG TEAM has an extra Grass Energy attached, you get the team bonus: shuffling your entire discard pile into your deck! Suddenly having all of your cards back in the mix could tip the odds in your favor in a hurry. Let's see what the game designers at Pokémon TCG developer Creatures Inc. can tell us about this mighty team-up! Atsushi Nagashima, game director, Pokémon Trading Card Game: We envisioned that Celebi & Venusaur were protectors of the forest and actually came up with a background story for them. Venusaur, the keeper of the forest, was visited by Celebi, who came from the future, and they joined forces to preserve peace in the forest and ensure that it continued to thrive. We actually had an illustrator draw the scene of their first encounter [for a different version of this card]. We hope to be able to show that one to you soon. How did you capture the distinct traits of these two Pokémon on a single card? Mitsuhiro Arita, illustrator, Pokémon Trading Card Game: The idea for this one came from the concept of two pro wrestlers crossing arms side by side, so I used Venusaur's vine as if it were an arm to have it cross arms with Celebi. Since Celebi usually floats in the air, it was easy to draw this one. Magikarp might have a wimpy reputation, but when it pairs up with Wailord, there's nothing puny about the power of this TAG TEAM. Magikarp & Wailord-GX features a massive 300 HP, a first for any Pokémon in the Pokémon TCG, and its attacks are just as massive. The Super Splash attack has a steep Energy cost but brings some impressive damage. 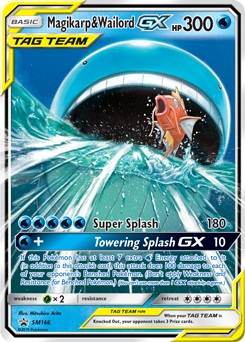 The Towering Splash-GX attack can really bring the deluge: if you attach enough Water Energy to activate the team bonus, it floods your opponent's side of the board with 100 damage to each of their Benched Pokémon. See what the game designers at Pokémon TCG developer Creatures Inc. are saying about this awesome aquatic pair! Atsushi Nagashima, game director, Pokémon Trading Card Game: The theme of TAG TEAM Pokémon-GX is two Pokémon forming a dream team and battling together. We knew we wanted to come up with some combinations that could only be possible in the Pokémon TCG and would really surprise players. We focused on pairs that had us really using our imagination to think of what kind of attacks they might use if they formed a team. This pairing features the biggest Pokémon alongside a Pokémon that is said to be the weakest, making them feel like a big mismatch, which we felt would be perfect for a TAG TEAM Pokémon-GX card. Mitsuhiro Arita, illustrator, Pokémon Trading Card Game: Water-type Pokémon give a rather plain impression if you draw them in an underwater setting, so I made Magikarp jump. With the seawater pouring into Wailord's gaping mouth, I was able to give a sense of momentum to the art, but I hope everyone will worry for Magikarp and hope it doesn't get sucked in with the water! The Magikarp & Wailord-GX card pictured here will be available in the Pokémon TCG: Towering Splash-GX Box, which will be available January 4, 2019. Magikarp and Wailord will also team up on cards featured in the Pokémon TCG: Sun & Moon—Team Up expansion. The size difference between Pikachu and Zekrom may be considerable, but Pikachu & Zekrom-GX is ready for battles big and small! The duo's Full Blitz attack hits hard and charges up one of your Pokémon with Lightning Energy. Load those Energy onto Pikachu & Zekrom-GX itself to unlock a special “team bonus” that's unique to TAG TEAM Pokémon-GX: each one has a GX attack that gets better if you attach extra Energy. In this case, Tag Bolt-GX does 200 damage when the Pokémon has 3 Lightning Energy attached. If you attach 3 more—that's 6 Lightning Energy total—it does 200 damage to the Active Pokémon, plus 170 to one of your opponent's Benched Pokémon! That's enough to take out two heavy-hitting Pokémon in one well-timed blast. 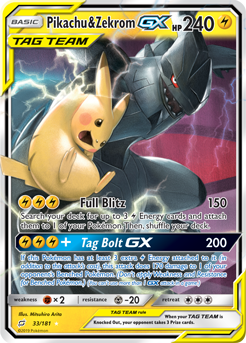 Your foes are in for quite a shock when Pikachu & Zekrom-GX enters the battle! Check out what the game designers at Pokémon TCG developer Creatures Inc. have to say about this dynamic duo! Atsushi Nagashima, game director, Pokémon Trading Card Game: With the Pokémon-GX cards up until now, we primarily focused on making them really interesting from a game data perspective by implementing fun logic and gimmicks in their GX attacks. This time around, we thought about how the relationship between Pokémon and Trainers has been depicted quite a lot, but what about the relationship between different Pokémon? With that concept as a base, we tried to come up with lots of fun Pokémon combinations with the goal of making them exciting, unexpected, or a kind of dream team for fans. Our theme was to find a unique way to express the Pokémon from a non-gameplay angle this time. We then added a new type of GX attack that gets stronger when you have extra Energy attached to the card, which is a characteristic of the TAG TEAM Pokémon-GX cards, and worked to make these cards stronger than any past single cards. With the first TAG TEAM Pokémon-GX card, we knew we wanted to feature Pikachu, which is such a beloved character around the world. We wanted to make the pairing really exciting, surprising, and feature a dramatic size difference between the two featured Pokémon while also expressing synergy between Pokémon that share a type, so after careful consideration, we settled on Pikachu & Zekrom for the card. Mitsuhiro Arita, illustrator, Pokémon Trading Card Game: Pikachu represents the cuteness of the Pokémon world, while Zekrom represents what cool can look like. I spent a lot of time trying to find the right pose for each of these Pokémon to express these traits. I feel like was I able to strike a good balance in making both Pokémon stand out and have a sense of presence by using the contrast of Zekrom's large size and black color with Pikachu's much smaller body and yellow color.